Surely the best and fastest Mac MP4 converter that you ever used! Support almost all video formats including AVI, MPEG, VOB, 3GP, MOV, MP4, M4V, etc. and convert them to MP4 format for iPhone, iPod, Apple TV, PSP, PS3. Also you can extract MP3, AAC and M4A audios from those formats of videos. This Mac MP4 video converter also allows you to trim an input video to get a segment out, preview the loaded videos and take snapshot, and further customize the professional parameter settings for the output video/audio to get specific playing effect that you need. We develop this Mac MP4 converter for all MP4 players and it will most simplify your choice and operation. Free download mediAvatar MP4 Converter Mac to convert between MP4 and other videos now. Easy to use, high speed and high output quality, that's what we want and what you need! 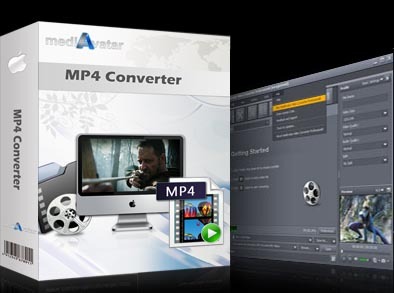 mediAvatar MP4 Converter Mac can freely convert all popular video formats like AVI, MPEG, VOB, MKV, etc. to MP4 as well as AVI videos. This means all players that accept MP4 or AVI like PSP, PS3, iPod, iPhone, Apple TV, Archos, iRiver PMP and Creative Zen can find a solution here. On the contrary, this MP4 convert for Mac can convert MP4 to AVI and other video formats. Not only convert MP4 videos, you can also convert MP4 and other format videos to MP3, M4A and AAC audios. Freely changed the parameters of the output files like screen size, video quality, audio quality, bit rates and so on to make them more suitable for your player. For the loaded videos, you can use the built-in resizable player to preview. When you want to save a nice screen, just one click to take a quick snapshot for that. As a proffessional converter, mediAvatar MP4 Converter Mac allows users to modify the file formats (profiles) and you can save them as your own formats for the future use. You can load as many videos as you like and convert them to MP4 format in batches with one single click. We divide all the output formats by the player and mediAvatar MP4 Converter Mac perfectly supports PS3, PSP, iPod, iPhone, Mobile phone, HD TV, etc. By setting a split size or time, you can realize seamlessly split target file to several ones. When previewing loaded video files on the built-in player, you can take snapshots of scenes and save as picture files to use as thumbnails or covers. Convert videos from HD to HD, HD to SD, SD to HD and SD to SD on Mac, extract audio from video and convert between audio formats.